The same day Los Angeles Sheriff Lee Baca became co-chair, with Dianne Feinstein, of the No on 19 campaign, he held a press conference to announce the arrest of a suspect in a triple murder case in West Hollywood. Los Angeles Police Chief Charles Beck has disputed Baca’s claim. “Banks are more likely to get robbed than medical marijuana dispensaries,” he told the Daily News in January. Baca also claimed that as many as 97 percent of dispensaries operate as criminal enterprises, and that many buy their marijuana from Mexican drug cartels. According to Thomas Watkins of the Associated Press, “Baca presented no evidence to support his claim.” The DEA also said that they could not substantiate Baca’s allegations. In the absence of proof, where is Baca’s overheated rhetoric coming from? Baca is an enthusiastic advocate of Scientology’s drug treatment programs, which he actively promotes. Baca has close ties to Scientology, and claims to have to trained deputies in his department using Scientology materials. The Scientology website says that it “sponsors” the independent non-profits drug treatment programs Narconon and Criminon, which and are based on “The Fundamentals of Thought” by Scientology founder L. Ron Hubbard. Hubbard’s purification treatments are the mainstay of Narconon, a Scientology-run chain of 33 alcohol and drug rehabilitation centers — some in prisons under the name “Criminon” — in 12 countries. Narconon [is a] classic vehicle for drawing addicts into the cult. Revenues for Narconon and other drug treatment programs are generated in large part by court-ordered rehabilitation for drug users, which would be dramatically reduced if marijuana prohibition ended. Much like other elements of the prison industrial complex, Narconon has campaigned aggressively against medical marijuana over the years. The California Department of Education issued a report, which indicated that Narconon’s program materials were “exaggerated” and contained “inaccurate and misleading drug-related information” that would “confuse students and be perceived as designed to arouse fear” — much like Lee Baca’s press conference. Following the release of the report, the Los Angeles and San Francisco school districts banned the Narconon program from their classrooms, as did Hawaii and Boston. The Church of Scientology made extensive use of Baca’s statement and presence at the event as LA County Sheriff to promote and legitimize its programs. According to the Narconon press release, Baca invited Teddy Chambers of Narconon International to provide a “drug education and awareness back-up” for the program. Narconon also claims that they distributed their educational materials at the launch of the Gardena dropoff box. 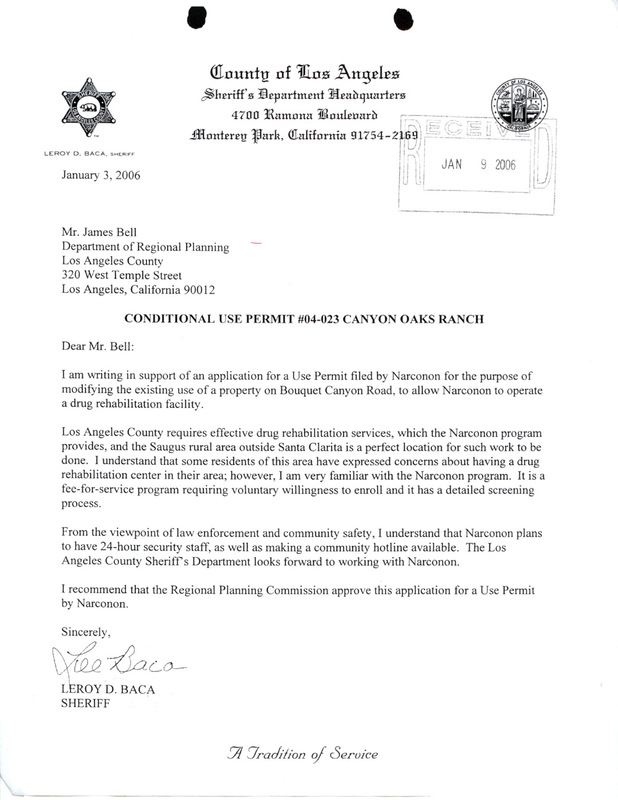 “The Los Angeles Sheriff’s Department looks forward to working with Narconon,” concludes Baca, who recommends that the Regional Planning Commission approve their use permit despite the objection of local residents. Its sister program Criminon recently entered the headlines when Sharon Angle, the Republican candidate for US Senate in Nevada, was attacked during the GOP primary by opponent Sue Lowden for urging that Nevada prisons adopt Criminon “Second Chance” program. Harry Reid subsequently picked up Lowden’s line of attack. Critics of the Narconon/Criminon programs have accused them of encouraging tough anti-drug laws because it increases their customer base — and their revenues. The Department of Health & Human Services’ Office of Applied Studies indicates that 58% of the people in drug treatment for marijuana were referred there by the criminal justice system — a higher percentage than for any other drug, including alcohol. Of those, 36% have had no use in the previous month, and 61.6% have had no previous treatment episodes. Narconon franchises operate as independent 501-c(3) non-profit organizations in numerous states. A 2008 Form 990 filed by Narconon of Southern California (PDF) indicates that they operate three drug rehabilitation facilities in the region. During 2008, they report that “400 persons completed the program.” The treatment facilities generated revenues of $14,515,454 — or approximately $36,288 for every person who completed the program. By choosing Lee Baca as co-chair of “No on 19” and offering him a platform to advance the theories of L. Ron Hubbard on their behalf, the campaign has associated itself with claims of dubious legitimacy that serve the interests of a revenue-generating enterprise. Any medical treatment organization that demands the criminalization of is patients in order to guarantee participation in their program should be instantly suspect, as should those like No on 19 Co-Chair Lee Baca who proselytize on their behalf. In 2005, California Superintendent of Schools Jack O’Connell urged that all California schools ban the Narconon education program, saying that “this program is filled with inaccuracies and does not reflect widespread medical and factual evidence.” He acted after a series in the San Francisco Chronicle reported that Narconon used their presence in public schools to introduce students to Scientology beliefs without their knowledge. Its sister program, Criminon, recently entered the headlines when Sharron Angle, the Republican candidate for US Senate in Nevada, was attacked during the GOP primary by opponent Sue Lowden for urging that Nevada prisons adopt Criminon “Second Chance” program. Harry Reid subsequently picked up Lowden’s line of attack.